Welcome to the September links. These are articles that I tweeted and or received from viewers during the month of September on special needs and developmental disability topics. Enjoy! What Kind of Visual Schedule Do I Need? Raising a child with autism may take a deeper toll than previously thought with new research suggesting that such moms face a heightened risk of heart disease. According to the Centers for Disease Control and Prevention (CDC), cerebral palsy is the most common motor disability in childhood. About I in 323 children are diagnosed each year. Although more than likely, cerebral palsy has been around for years, it was not until the 19th century that cerebral palsy was given a name. 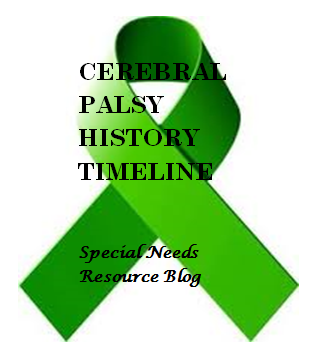 Here are some key events in cerebral palsy history. 1810- Dr. William John Little is credited with first identifying spastic diplegia is born. 1836- Louis Stromeyer corrects John Little’s club foot. This discovery begins a career in understanding and treating childhood impairments. 1843- Dr. William John Little begins lecturing on spastic ridgity. 1853. Dr. William John Little publishes On the Nature and Treatment of the Deformities of the Human Frame. 1861- Dr. William John Little establishes the classic definition of spastic cerebral palsy. 1937- Herbert A. Everest and Harry Jennings Sr., built a lightweight collapsible wheelchair. 1937- The Children’s Rehabilitation Insitute is founded by Dr. Winthrope Phelps specializing in children with cerebral palsy. 1946- Cerebral Palsy of New York State founded by parents of children with cerebral palsy. 1948- United Cerebral Palsy is incorporated. 1949- United Cerebral Palsy founded by Leonard Goldenson, his wife Isabel, Nina Eaton and Jack and Ethel Hausman. 2002- Centers for Disease Control and Prevention (CDC) conducts first U.S. multi-state study on the prevalence. 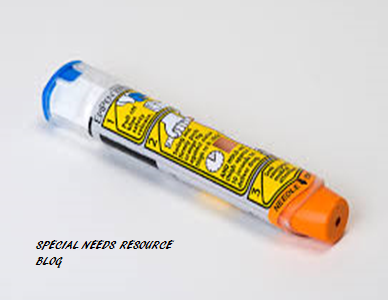 An EpiPen (short for Epinephrine) is often used in life-threatening emergencies to treat allergic reactions to insect stings such as bees, yellow jackets and hornets. When a person is stung by an insect, the normal reaction includes swelling and redness around the site. There are those however that experience an allergic reaction, also know as an anaphylactic reaction. Other serious allergic reactions may include foods such as eggs, milk, peanuts, shellfish and wheat. The symptoms of a severe allergic reaction include: trouble breathing, a rash, difficulty swallowing. dizziness, heart palpitations and chest discomfort. EpiPens are pre-filled and delivers medication into the muscle of the outer thigh. The injection reduces swelling of the throat and face, stimulates the heart and raises the blood pressure. Anyone that uses the auto injector, should still be checked out by a health care specialist. Anyone who knows someone with autism knows that — of course! — people with autism have feelings. Sometimes very strong feelings. Just like everyone else. People with autism can be happy, sad, excited, depressed, frustrated, or angry.But…The myth that “people with autism are emotionless” persists Why? There are a few reasons; some good and some — pretty silly. For example: Read the rest of the story here. On October 19-21, 2016, the National Conference on Special Needs Trusts and Special Needs Planning will present a conference on Special Needs Trusts. A Pre-conference will be held, October 19, 2016 on tax issues in special needs planning. Since the early 1900’s, home schooling children in the United States has continue to grow in leaps and bounds. Many parents have decided to educate their children at home for many reasons including protecting their children from bullies, concerned with the academic instruction, the ability to give their special needs child one on one attention and having control over their child’s education. 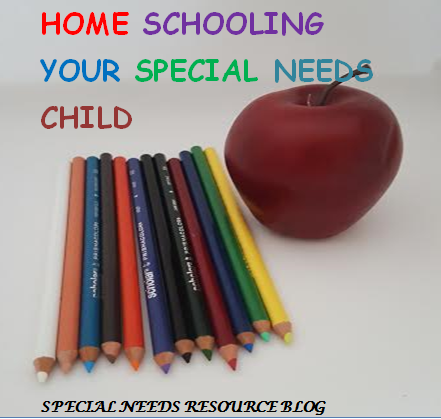 Homeschooling a Struggling Learner– provides regulations for each state. The rules vary for each state. A few States require that local officials are notified on the intend of home schooling your child, while other may require assessment test. HSLDA– Non-profit advocacy organization established to defend the right of parents.